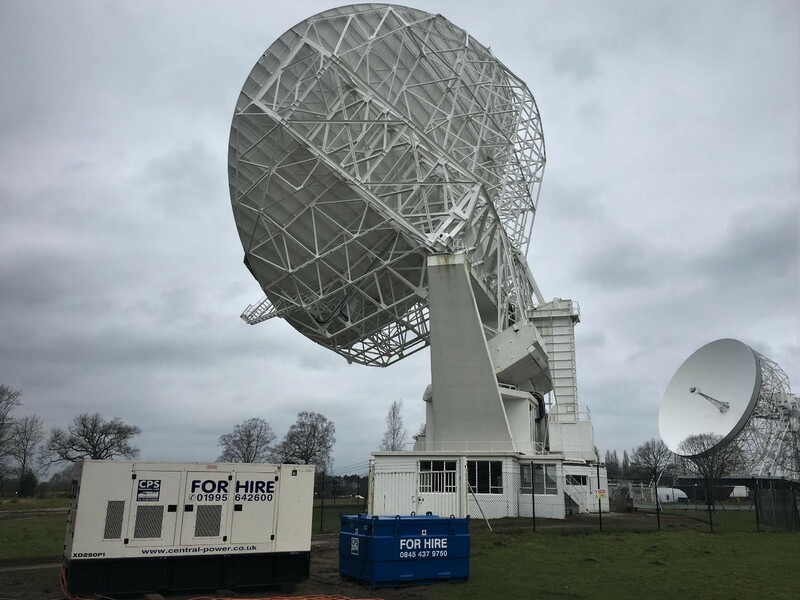 Central Power Services were delighted to help power our search of the cosmos recently, when Jodrell Bank undertook some essential upgrades. We supplied two generator units to keep the Mark II telescope switched on during the important work. The Mark II telescope measures an impressive 38m by 25m (125ft by 83ft) and has been in operation at Jodrell Bank since 1964. It forms part of the country-wide MERLIN array (Multi Element Radio Linked Interferometer Network) which stretches across England and the Welsh Borders, creating an array measuring 135miles long. This delivers remarkable resolution and MERLIN is constantly at work unlocking the mysteries of the universe. We hired two super silent generators to provide essential backup power supplies as well as temporary main power during the works. Without this CPS backup, the Mark II may have had to be taken offline, breaking the MERLIN chain and putting key projects back by months. As it was, our dependable, silent generators kept all eyes upwards, ensuring there were no interruptions to the important astronomical work.